I'm using the Scanner and Camera Wizard built into WinXP and I'm finding it quite conveniant. However, something has happened that make it less conveniant, and I hope this could be fixed somehow... Maybe a registry-key that has been messed up? 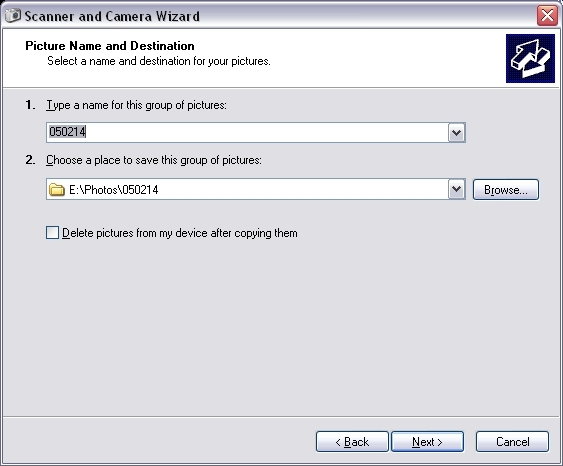 When I come to the "Picture name and destination" step I used to just type a name for the group of photos (normaly a date), and then the path to the place to save the photos would automatically change and give me a subfolder with the name of my photo-group. As you see in the attached screen-dump the group name, and the folder name is the same. Nobody geeky enough out there to help me with this?